Chinwe Ezeanya is a poet and a writer. Her story touches the heart, forcing those who have read her book, “More than a Miracle”, to shed tears. It is almost unlikely to come across a person that will give her organ to another soul. But Ezeanya’s sense of humanity made her donate her liver so that her only son, who required an organ transplant could live. More Than a Miracle is a true life story. It is an account of a mother’s enduring trial, faith and love for her child. It is not the archetypal fiction, adapted into a Nollywood flick for undiscerning viewers. To the contrary, however, it is an incredible story worth telling because of its uniqueness. It tells of Ezeanya’s openness about her excruciating journey to save Dike Ezeanya, her only son, who was diagnosed with medical challenges after his birth. The book revealed that Ezeanya donated her liver to an Indian family, who in turn swapped their own liver to save Dike. She also set up a Dike Ezeanya Foundation for Liver Diseases (DEFFLID) to provide direction and support for people with liver diseases and similar health challenges. The book, which is available on Amazon, Terra Kulture, Jazzhole and Konga Link, and other book outlets nationwide, runs into five chapters. It was published in 2018 and reviewed by a renowned journalist, Constance Ikokwu, during its launch at Merit House, Maitama, Abuja. The 250 pages account is truly a masterpiece. Ezeanya’s agony began when she was pregnant with Dike and to the point when she realised that there was something egregiously wrong with the newborn baby boy. The book narrated in engrossing details, the medical journey she went through plus the pains and frustration she experienced, visiting doctors in search of explanation. She also had many sleepless nights, weeping and agonising. “This is a unique story worth telling because it brings out a personal belief- the strength of believing that there is nothing that God wants you to achieve that you will not be able to achieve. It is also a story about an incredible boy bringing joy to the family. Every child ought to be a subject of love, somebody that you cuddle, bring up and you give the person the best that you can. When I look around in Nigeria, I am afraid that my conclusion, seeing children who are begging in street corners, that something is missing in our DNA on how to love children. If there has been any serious love they are not going to allow begging on the streets, those children would have been in schools. “They would have been the foundation of human capital. 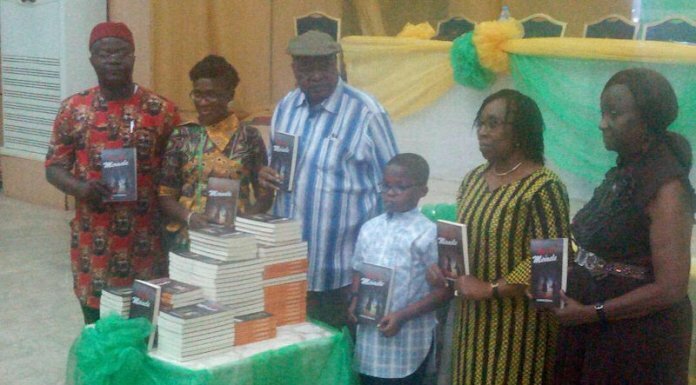 Let us bear in mind that those of you, who for whatever reason, come across a child who needs help, who ought to be helped, to insensitive government who allows the future of the nation to go unprotected on health, then we have to raise our voices in very serious protest,” remarked the chairman of the book launch, Ambassador Dele Cole. She also acknowledged that given her plight, the author had to learn to deal with the tough time by coming to the conclusion that it was better to hitch her wagon with God and to embrace advancements in medicine. The book lays bare the poor medical conditions of Nigeria and many people are likely to react to it in a variety of ways. The author said her motive for writing More Than A Miracle was stirred by feeling that she needed to talk about Dike and her personal life as it would be impossible for her without talking about the things that she felt especially concerning this issue.